Prophets of Saturn are four dudes from Leicester, England. 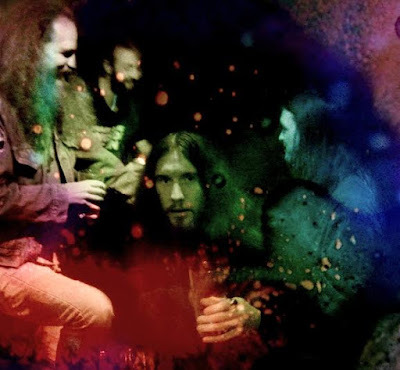 Although they might have some vision, their music is mostly soaked in dirty and sheer retro psychedelic stoner/doom as they love and can play such stuff. George Sandersen (vocals) and Max Mead (bass) also play in Slow Worm band as for Duncan Torrance (drums) and Benjamin Shone (guitars) it seems to be their first experience. However they have succeeded and their first self-titled record was released on cassette by Cosmic Tomb Records, and new big work “Retronauts” was produced by HeviSike Records. I had a brief conversation with Ben, so you can know read more about the band from it. How are you there? What’s current status of the band? We’re taking a break from gigging this winter, working on some new material. We’ll be back on the road in the spring! 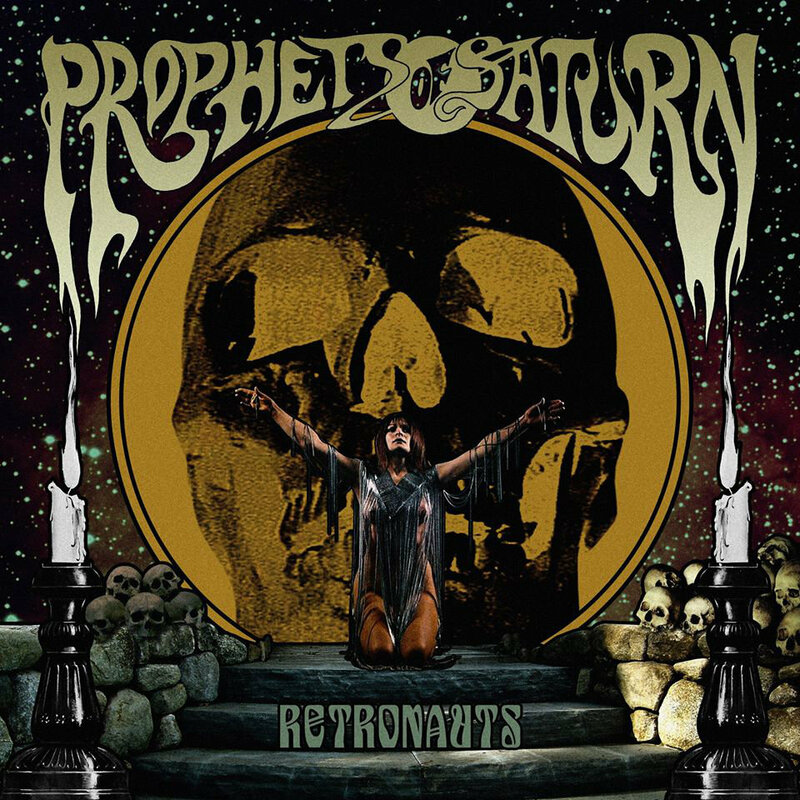 Prophets of Saturn is a young band, what kind of power brought you all together and drove to compose and place psychedelic doom tunes? The love of old bands such as Black Sabbath, Led Zeppelin, Blue Cheer, Cream, etc… but especially Black Sabbath! Metal-archives say that band’s lyrical themes are “occultism and drugs”. Should we believe to metal-archives? What is band’s ideology? I’m not sure we have an ‘ideology’ as such – we’re not out to say ‘this is good, this is bad, do this, don’t do that’, y’know? It’s more a question of finding lyrical themes that complement the music. I think metal, in all its different styles, gives one more freedom with regard to lyrics than other genres of popular music, so one can explore whatever theme one wishes – so long as it’s heavy! Prophets of Saturn has two full length albums, first own self titled album was released in 2013. Did it draw some attention to the band? Did it change band’s life? It got some attention sure. Cosmic Tomb Records released the album on a very limited-run cassette, and that sold out almost instantly. It didn’t change our lives, but it did feel good to know that people were digging our stuff. Your second album “Retronauts” was released by HeviSike Records on July 2015, but, man, your sound still remains dirty and rough. What’re your requirements for Prophets of Saturn sound? Yeah we like it to sound organic, not too processed or clinical. We record at gig volume to try to capture the sonic textures you only get from amps being driven hard. Plus our drummer is a pretty heavy-hitter, so it’s pointless to try and record quietly! Got it! What’s about melodies and riffs? What songs structure you prefer most? Do you care about techniques of songs performing or loose jamming is enough for you? Who know where riffs come from? We just jam, and they materialize… As for structures, it depends on the song. ‘Retronauts’, for instance, is just the product of jamming it out loads of times, whereas ‘Damāvand’ was more consciously structured. The songs sort of write themselves in a way, the riffs themselves sort of tell you what kind of structure they need to fit into. Some of your musical influences are pretty obvious, as most of heavy stoner doom bands are under spell of few Old Ones. Do you have ambitions to saturate the genre with your own original ideas? Man, you’re Prophets of Saturn, a week ago I spoke with a man from Saturnalia Temple (Sweden), I also know High Priest of Saturn band (Norway) and Saturnine (Italy). Don’t you see this situation as disturbing one? Don’t you want to gather all together and do a tour in the name of Saturn?! Could be dangerous – the universe might collapse under all that Saturnalian weight! It would be a pretty cool tour all the same. I’ve seen mentions of Prophets of Saturn here and there… not too much, but I’ve seen positive reviews or two. How do you promote the band? The promotion for ‘Retronauts’ was handled by our label HeviSike, through a promotion agency called Sheltered Life… other than that, we think the best promotion is just playing good shows. If people like it they’ll tell other people about it. What’s about gigs? What were your highlights considering live shows? One that stands out in my memory is the album launch show, on 17th July, at a place called the Musician, here in Leicester. Awesome support in the form of Mammothwing, who turned up tripping their faces off on mushrooms, then proceeded to blow everyone away. Hard act to follow, but we totally pulled it off. Just one of those nights where everything went really well – and the audience loved it! Okay, I have two standard questions for bands. First one – tell a story of your favourite song from new album? I’m afraid all our stories are the same – turn up, turn the amps on full, get drunk and high, JAM! And second one is about book that influenced you the most during school years? Difficult one – I’ve always read a lot of stuff. Nietzsche and Marx were big influences on me during school, also Tolkien, Dylan Thomas, and the English romantic poets, Keats especially. Ben, you live in Leicester, don’t remember if I ever did an interview with band from this city. How does it feel to live there? I like it, it’s quite a comfortable city, with a mellow vibe. And there’s quite a good music scene here, loads of bands and performers of all sorts. It’s also relatively cheap to live here, which is a bonus!